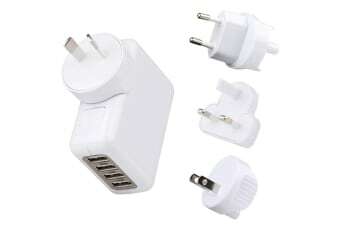 A rapid travel charger that’s compatible with power points in a host of foreign countries! 4 ports to charge multiple devices at once. Compact and lightweight – perfect for overseas travel. Faster charging – Charge up to 4 devices in a fraction of the time used by most conventional USB wall chargers. The Kogan 4-Port USB Rapid Travel Charger comes with AC plugs that are compatible with power points in North America, Japan, China, United Kingdom, Continental Europe, Korea, Australia and Hong Kong. Remain in charge with this handy little travel charger no matter where you are! 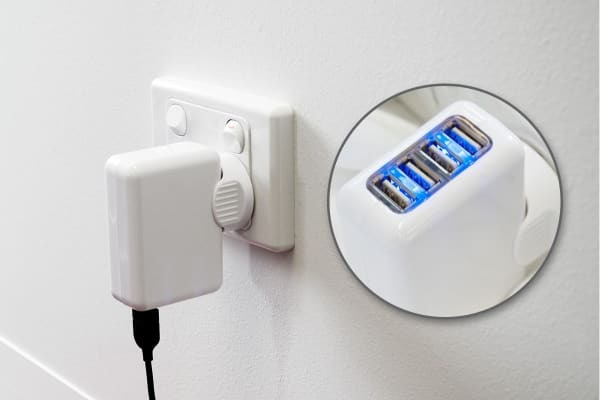 Recharge any compatible USB devices using this convenient USB charging port. Handy compact gadget as advertised but a little stiff changing the plugs.